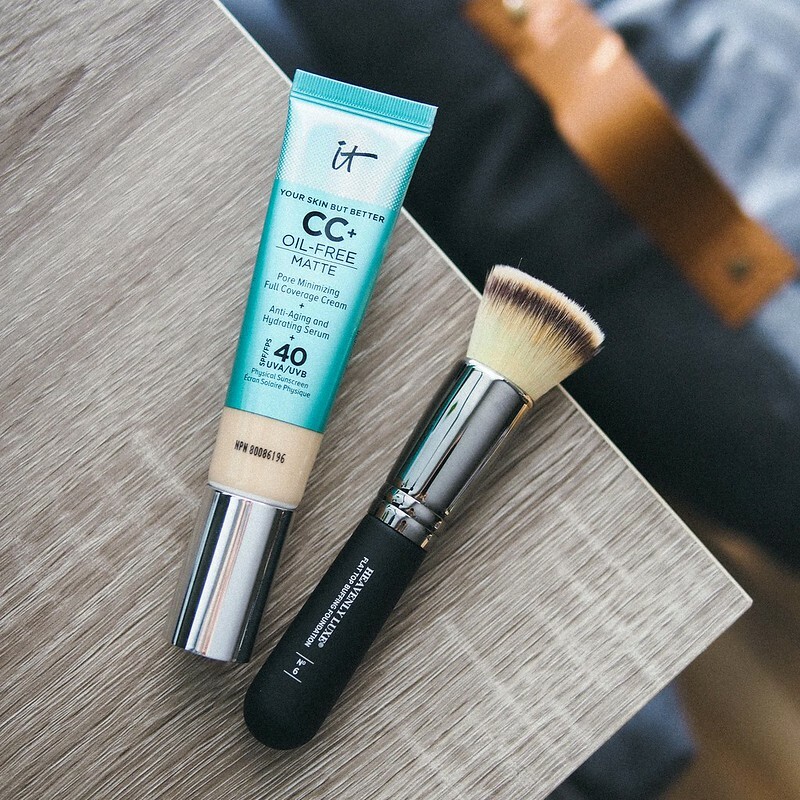 Cue the dramatic stage lights everybody – today we’re talking about the IT Cosmetics CC+ Cream Matte SPF40* which launched in 2018 following the incredibly successful original CC+ Cream. Same same but different, this version came as a response to those who either preferred a more matte finish or had oily skin and had trouble making the first version last. This matte release contains similar claims but is tweaked for those with larger pores, oily and/or acne prone skin challenges. Developed with plastic surgeons, Your Skin But Better CC+ Oil-Free Matte with SPF 40 delivers color-correcting full coverage, anti-aging skincare and SPF 40 broad-spectrum physical sunscreen—all with a poreless, natural-looking matte finish that lasts! This multitasking, complexion-perfecting breakthrough instantly camouflages skin imperfections including dark spots without creasing or cracking and is clinically tested to reduce shine and control oil for up to 12 hours. It’s also infused with charcoal to detoxify, colloidal clay to absorb oil and tea tree extract to combat blemishes—plus, an advanced anti-aging serum made of hydrolyzed collagen, peptides, niacin, hyaluronic acid, vitamins and antioxidants. You’ll see powerful results instantly and more dramatic results over time! Would I (re)purchase: Probably yes. Lip balms. 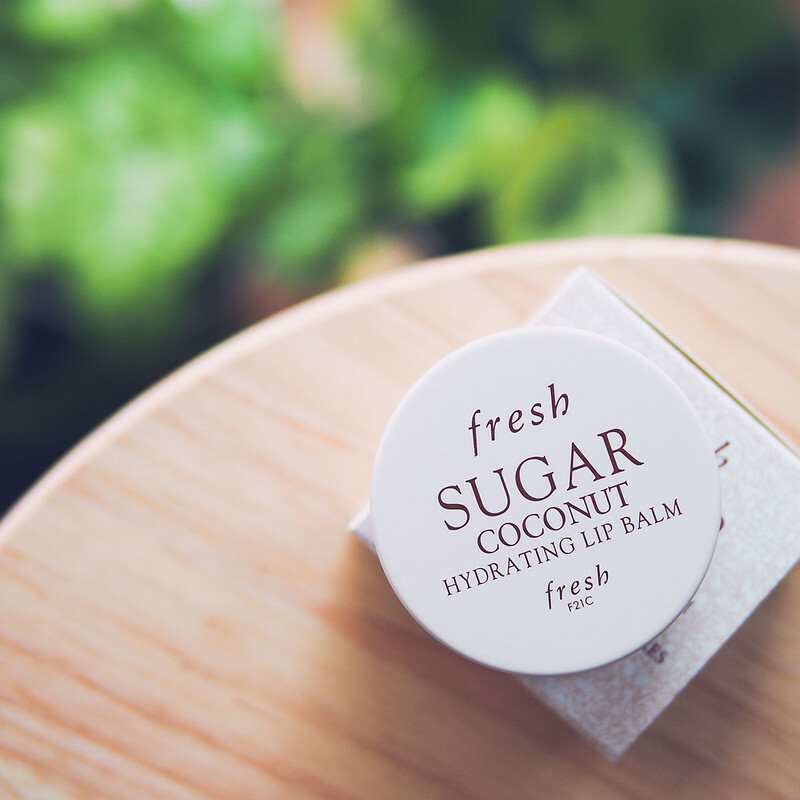 It seems that while there’s always a new variety to try, finding a lasting favourite has always been a challenge – my current experiment is the FRESH Sugar Coconut Hydrating Lip Balm. Now while the original FRESH balms in twist up tubes are much loved, I couldn’t get past the scent which eventually deterred me from keeping them in my collection. INGREDIENTS: Isononyl Isononanoate, C10-30 Cholesterol/Lanosterol Esters, Bis-Diglyceryl Polyacyladipate-2, Cera Microcristallina (Microcrystalline Wax), Polybutene, Ethylene/Propylene/Styrene Copolymer, Glyceryl Behenate/Eicosadioate, Ethylhexyl Methoxycinnamate, Prunus Armeniaca (Apricot) Kernel Oil, Butylene/Ethylene/Styrene Copolymer, Ribes Nigrum (Black Currant) Seed Oil, Vitis Vinifera (Grape) Seed Oil, Sucrose Tetrastearate Triacetate, Tocopherol, Ascorbyl Palmitate, Fragrance, Silica Silylate, Ci 77891 (Titanium Dioxide), Bht, Synthetic Fluorphlogopite, Ammonium Glycyrrhizate, Vanillin, Polyglyceryl-2 Triisostearate, Trimethylolpropane Triisostearate, Water, Propyl Gallate, Phenoxyethanol. According to Sephora online, this (along with its caramel counterpart) is listed as an limited edition release but I’ll have to get back to you on that. Marked as a hydrating treatment balm, it clams to sooth dry chapped lips, provide subtle shine and not leave a sticky after feel. I love how this balm is creamy yet not gooey or tacky. It falls somewhere between a balm and a cream without the waxy suffocating feel of traditional potted lip products. Now, as most people, I don’t love the idea of using my fingers for applying especially when I need a quick touch up out and about but I do think the beautiful texture can likely only work in a pot format. It feels like a good winter moisturizer on your lips. 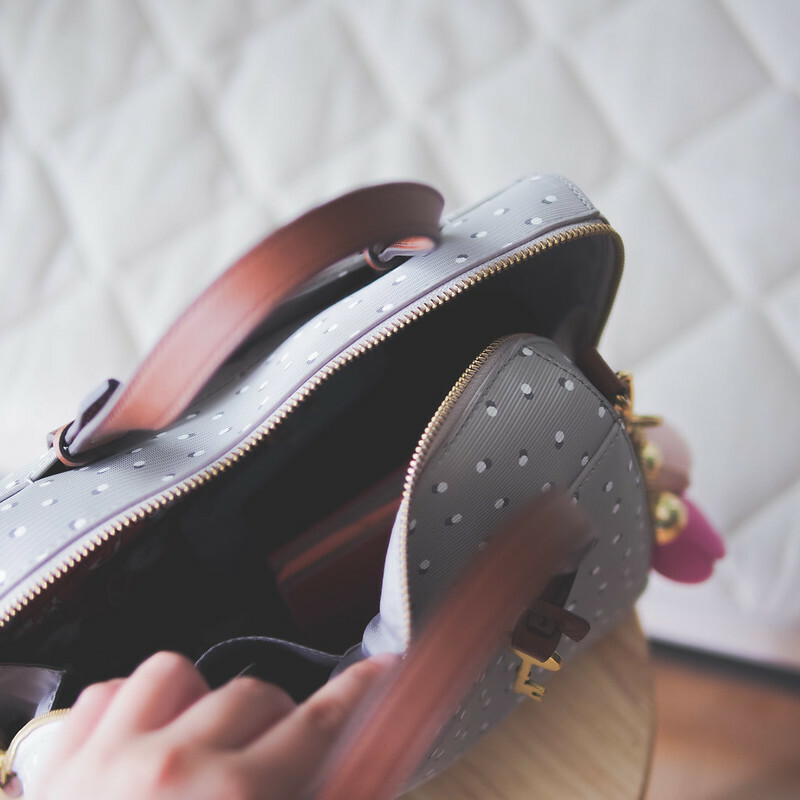 There’s no greasy slip, it’s not a thick waxy layer but it finds a good balance between being present and not intruding on your day to day activities. I can also report that even with long hair, the stick factor is pretty low. There is a subtle hint of shine but nothing that I think would deter this from being used (and loved) by men and women alike. No weird tastes either. After wearing this both during the day and also as a nightly “treatment” product, I’d say it makes a good attempt at healing dry peeling lips. It’s not quite on par with something like the FRESH Lip Therapy but I can see this as a great everyday substitute. I get the best results when I leave this Coconut Balm on overnight, then do a lip scrub in the morning followed by another layer of balm. It also wears off evenly and doesn’t make your lips thirstier as some waxy products do. Reapplication is needed every 2-3 hours. 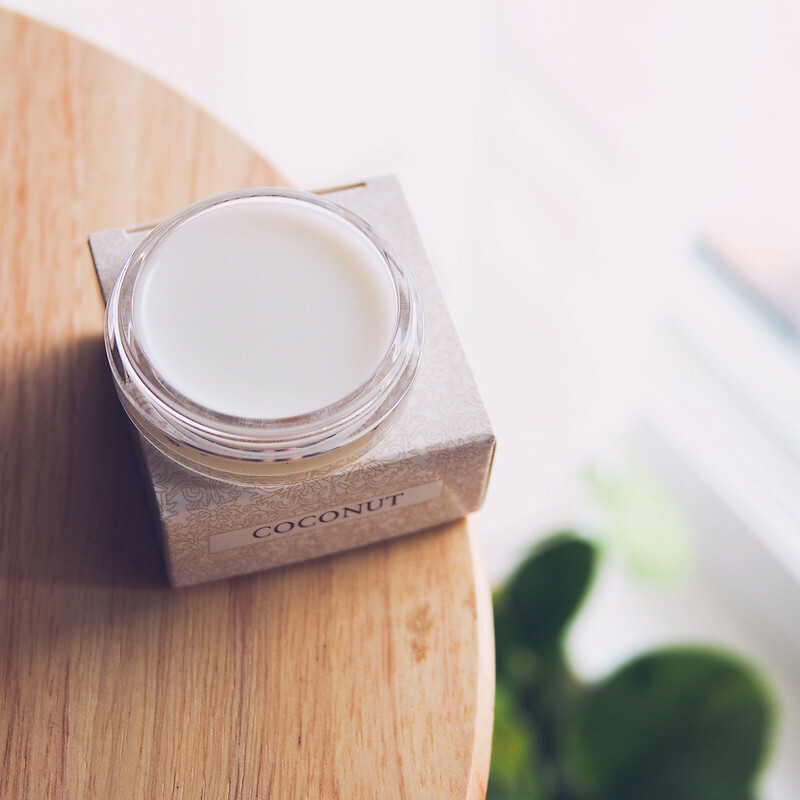 FRESH’s Coconut Lip Balm is a like a moisturizing cream for weary lips that feels good to wear and wears comfortably too. Not the best primer for lipstick but for casual or no makeup days it’s the perfect pairing. Think of it as your favourite sweatshirt but in a lip product form! I’ll be wearing this for as long as I can stand digging into the pot every time which is still a major inconvenience for me. Will I still be looking for a solid long term steady? Yes, but I’m not in a hurry. IT Cosmetics is founded on the idea that your beauty deserves hard working, scientifically researched and results based ingredients. You’ll often find owner Jamie doing amazing on-air demonstrations on QVC (I’m completely a closet addict) and I see the brand as a more modern, green juice drinking version of Clinique. 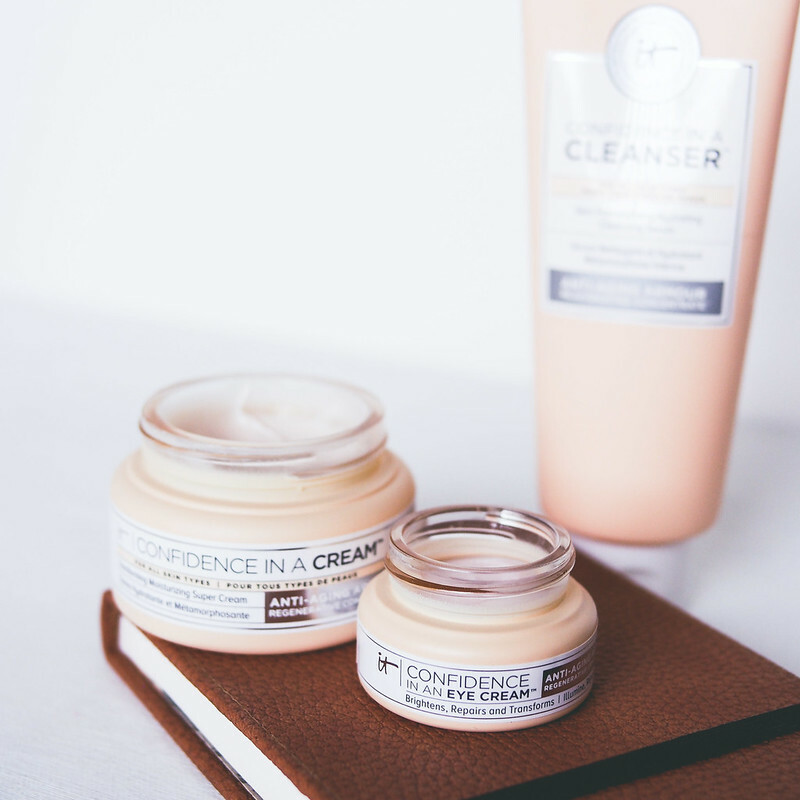 I’ve recently had the opportunity to try out the set of their Confidence Skincare* which boasts their clinically researched Anti-Aging Armour Rejuvenating Concentrate which contains a variety of collagen, peptides, oils and vitamins across all their products. A very likeable non-foaming / very light foaming cleanser that I prefer to use in the morning because it feels comfortable and easy on the skin. While I don’t find it drying, I also don’t find it particularly hydrating but this may vary depending on your skin type. Running through all three products is a light citrus scent which is evident by the various natural oils in this concoction. I do think it leaves my skin clean although I still don’t feel completely assured using this to remove my makeup. The effect and after-feel is comparable to something like Dermalogica Special Cleansing Gel – well balanced and comfortable. Now the real question is, do we really need such an expansive ingredients list for a cleanser when most people only spend 30 seconds washing their face? You decide. 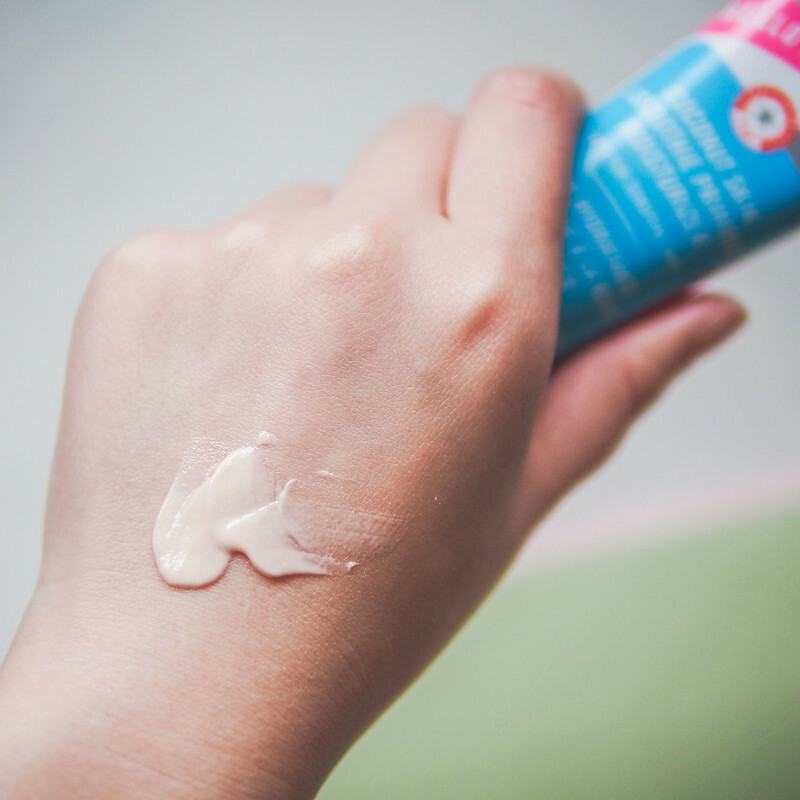 INGREDIENTS: Aqua/Water/Eau, Disodium Cocoamphodiacetate, Glycerin, Acrylates Copolymer, Sodium Chloride, 1,2-Hexanediol, PEG-7 Glyceryl Cocoate, Arginine Cocoate, Cocamidopropyl Betaine, PEG-120 Methyl Glucose Dioleate, Styrene/Acrylates Copolymer, Potassium Cocoyl Glycinate, Coco-Glucoside, Citric Acid, Hexylene Glycol, Portulaca Oleracea Extract, Limnanthes Alba (Meadowfoam) Seed Oil, Allantoin, Xanthan Gum, Cymbopogon Martini Oil, Pelargonium Graveolens Flower Oil, Citrus Paradisi (Grapefruit) Peel Oil, Lavandula Angustifolia (Lavender) Oil, Citrus Sinensis Peel Oil Expressed, Butylene Glycol, Hydrolyzed Collagen, Ethylhexylglycerin, Niacinamide, Camellia Sinensis Leaf Extract, Tocopheryl Acetate, Ascorbyl Tetraisopalmitate, Glycyrrhiza Glabra (Licorice) Root Extract, Chamomilla Recutita (Matricaria) Flower Water, Colloidal Oatmeal, Leuconostoc/Radish Root Ferment Filtrate, Aloe Barbadensis Leaf Extract, Curcuma Longa (Turmeric) Root Extract, Melaleuca Alternifolia (Tea Tree) Leaf Oil, Glyceryl Stearate, Palmitic Acid, Stearic Acid, Phytosteryl/Isostearyl/Cetyl/Stearyl/Behenyl Dimer Dilinoleate, Hydrogenated Polydecene, Ceramide Np, Butyrospermum Parkii (Shea) Butter, Ceteareth-20, Glyceryl Citrate/Lactate/Linoleate/Oleate, Hydroxypropyl Bispalmitamide Mea, Glycosphingolipids, Glycine Soja (Soybean) Sterols, Meadowfoam Estolide, Ceramide Ap, Ethylhexyl Isonanoate, Squalane, Sodium Hyaluronate, Polysorbate 20, Carbomer, Palmitoyl Pentapeptide-4, Steareth-20, Chrysin, Palmitoyl Tripeptide-1, Palmitoyl Tetrapeptide-7, N-Hydroxysuccinimide, Disodium EDTA, Benzoic Acid, Phenoxyethanol, Potassium Sorbate, Chlorhexidine Digluconate, FD&C Yellow No. 5 (CI 19140). 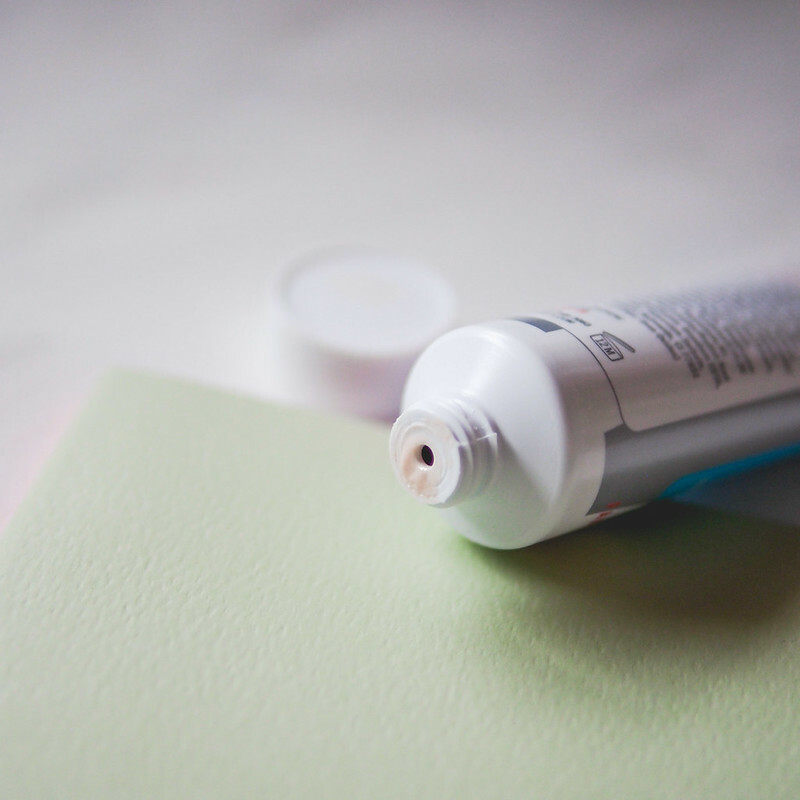 Having used face creams from a wide range of brands and price points, I can say straight away that I think this formulation is very reasonable value for money when factoring in ingredients and the overall feel of the product. This, in short, is what IT Cosmetics considers its do-it-all super cream that took 7 years to bring out. The application and texture reminds me of the Fresh Crème Ancienne in the sense it was thick and dense in the jar yet sat comfortable and non-greasy on the skin. The dry down is great for smoothing out the skin for foundation and I suspect that it’ll still be fresh enough for summer so I plan on finishing up the jar. If you have combination skin this would be very ideal. 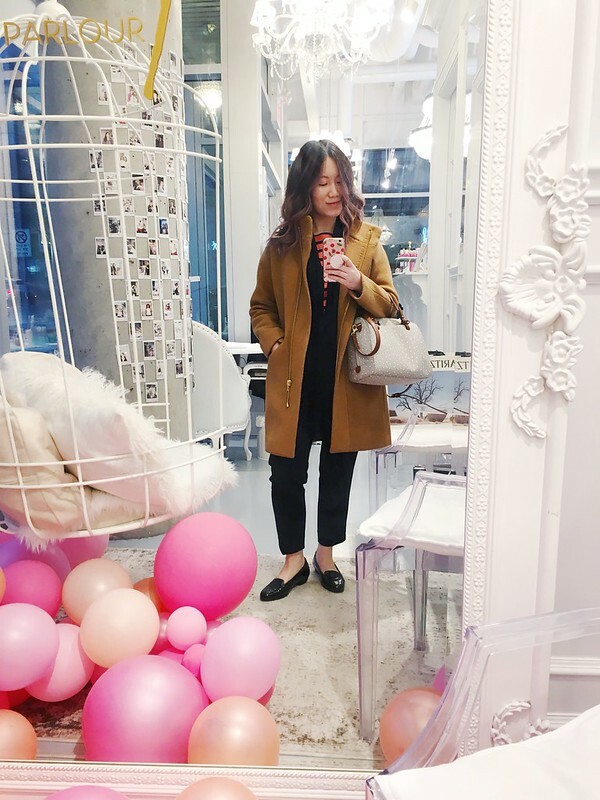 When it comes down to the boasted skincare effects, I must say that I don’t think I am the best person to test its results as anti-aging isn’t my major concern at the moment. 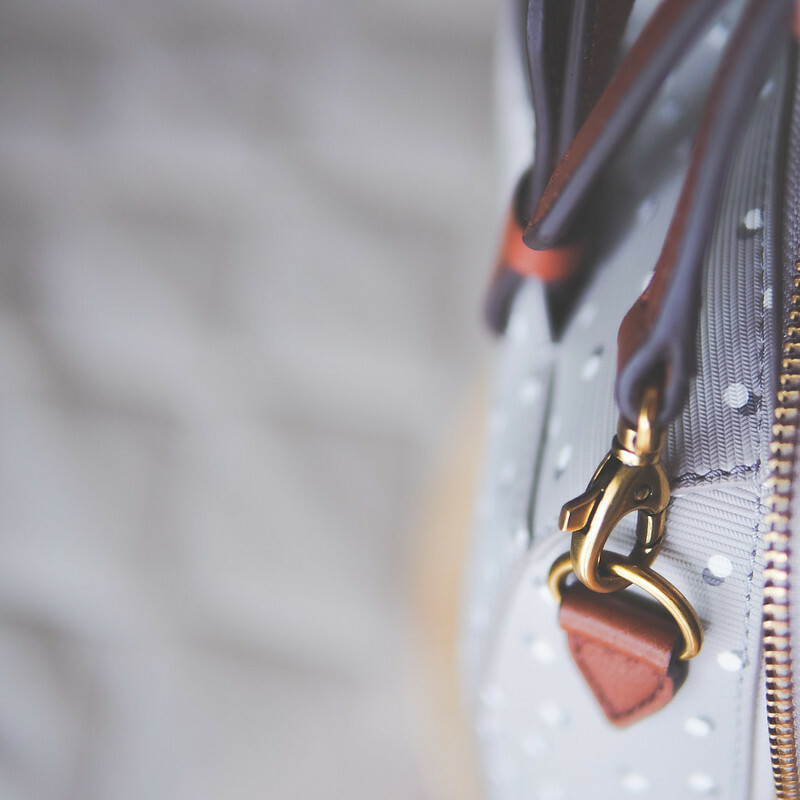 While preventative care is always recommended, my major skin struggles are still large pores and skin texture issues more so than wrinkles. 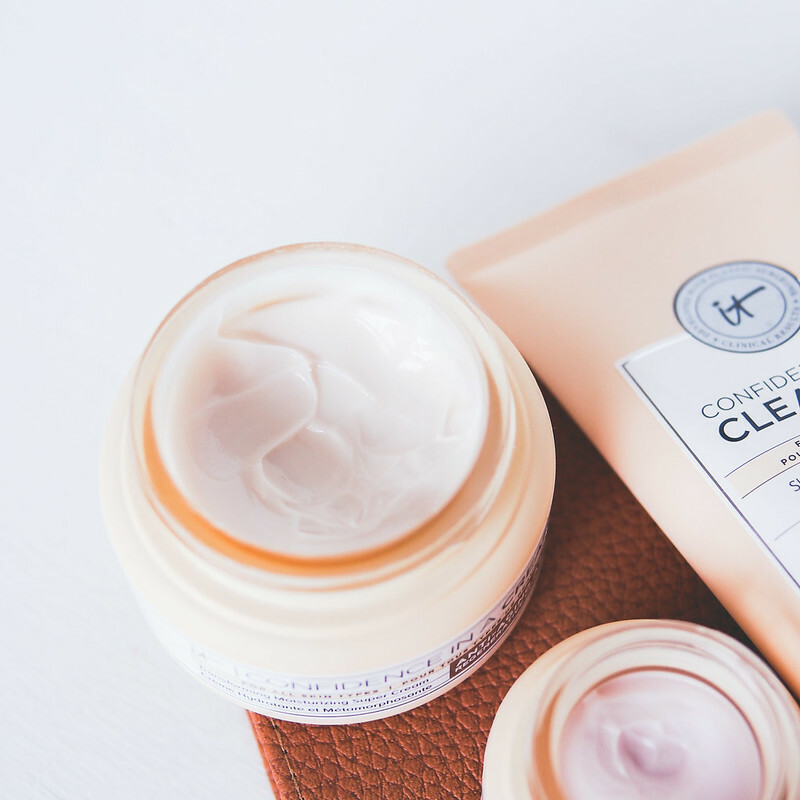 I can say that when used consistently, I found my skin to look plump and refreshed even when I definitely don’t feel that way on the inside. lagen, Camellia Sinensis Leaf Extract, Tocopheryl Acetate, Carbomer, PEG – 150 Distearate, Ceramide Ap, Glycosphingolipids, Glyceryl Polymethacrylate, Meadowfoam Estolide, Sorbitan Isostearate, Squalane, Palmitoyl Pentapeptide – 4, Polysorbate 20, Steareth – 20, N – Hydroxysuccinimide, Chrysin, Palmitoyl Tripeptide – 1, Palmitoyl Tetrapeptide – 7, Polysorbate 60, Aleuritic Acid, Yeast Extract, Glycoproteins, Betaine, Hydrogenated Polydecene, Ceramide NP, Allantoin, Colloidal Oatmeal, Retinyl Retinoate, Polylactic Acid, Canola Oil, Cholesteryl Nonanoate, Ascorbyl Tetraisopalmitate, Glycyrrhiza Glabra (Licorice) Root Extract, Chamomilla Recutita (Matricaria) Flower Water, Curcuma Longa (Turmeric) Root Extract, Leuconostoc/Radish Root Ferment Filtrate, Eruca Sativa Leaf Extract, Glyceryl Citrate / Lactate/Linoleate / Oleate, Ceteareth – 20, Hydroxypropyl Bispalmitamide Mea, Glycine Soja (Soybean) Sterols, Melaleuca Alternifolia (Tea Tree) Leaf Oil, Phytosteryl/Isostearyl/Cetyl/Stearyl/Behenyl Dimer Dilinoleate, Santalum Album (Sandalwood) Oil, Chamomilla Recutita (Matricaria) Flower Oil, Caprylhydroxamic Acid, Cetearyl Glucoside, Glucose, Stearyl Stearate, Tromethamine, Citric Acid, 1, 2 – Hexanediol, Chlorhexidine Digluconate, Potassium Sorbate, Dipropylene Glycol, Lavandula Angustifolia (Lavender) Oil, Citrus Paradisi (Grapefruit) Peel Oil, Cymbopogon Citratus Leaf Oil, Pelargonium Graveolens Oil, Citrus Aurantium Dulcis (Orange) Peel Oil, Pogostemon Cablin Oil, Citrus Aurantium Bergamia (Bergamot) Fruit Oil, Ethylhexylglycerin, Caramel, Disodium EDTA, Phenoxyethanol, Caprylyl Glycol, Limonene, Linalool. IT Cosmetics says: Brightens, repairs and transforms, this day to night eye cream will do it all from minimizing darkness to banishing wrinkles. As with the moisturizer, the texture of this eye cream is a big winner for me. Its very lightweight and silky plus leaves a slight sheen on the skin which I believe is what the brand claims as “brightening”. While I don’t think this would be sufficient moisture for the winter season, it’s perfectly balanced for summer and simply feels weightless on the skin. Results wise, I haven’t noticed any major improvement in undereye puffiness (which is my main concern) but it does seem to minimize fine dehydration lines at the outer corners. It’s definitely too soon for me to decide if this is a must-have product especially since I’m not a religious eye cream user so this is one that probably needs a second opinion. INGREDIENTS: Aqua/Water/Eau, Butylene Glycol, Cyclopentasiloxane, Cetearyl Alcohol, Butyrospermum Parkii (Shea) Butter, Palmitic Acid, Stearic Acid, Dimethicone, Niacinamide, PEG-40 Stearate, Polysorbate 60, Cetyl Ethylhexanoate, Glyceryl Stearate, Macadamia Ternifolia Seed Oil, Polyacrylate-13, Polysilicone-11, Helianthus Annuus (Sunflower) Seed Oil, Polyisobutene, Dimethicone/Vinyl Dimethicone Crosspolymer, Tromethamine, Sorbitan Stearate, Phenoxyethanol, Carbomer, Chlorphenesin, Acrylates/C10-30 Alkyl Acrylate Crosspolymer, Phenyl Trimethicone, Ethylhexylglycerin, Glycerin, Caprylyl Glycol, Polysorbate 20, Alkanna Tinctoria Root Extract, Sorbitan Isostearate, Synthetic Fluorphlogopite, Benzophenone-5, Tin Oxide, Coptis Japonica Root Extract, Alcohol, Disodium EDTA, Sodium Hyaluronate, Tocopherol, Citric Acid, Colloidal Oatmeal, Caffeine, Persea Gratissima (Avocado) Oil, Squalane, Cocos Nucifera (Coconut) Oil, Royal Jelly Extract, Camellia Sinensis Leaf Extract, Coffea Arabica (Coffee) Seed Extract, Panax Ginseng Root Extract, Cholesteryl Nonanoate, Cholesteryl Chloride, Cholesteryl Isostearate, Curcuma Longa (Turmeric) Root Extract, Glycyrrhiza Glabra (Licorice) Root Extract, Sodium Lauroyl Lactylate, Lecithin, Anthemis Nobilis Flower Extract, Caprylic/Capric Triglyceride, Steareth-20, Creatine, Maris Aqua/Sea Water/Eau De Mer, Aloe Barbadensis Leaf Extract, Ceramide NP, Panthenol, Polyglutamic Acid, Phytosphingosine, Ceramide Ap, Tocopheryl Acetate, Arginine, Isoleucine, Leucine, Valine, Threonine, Methionine, Lysine, Phenylalanine, Tryptophan, Cholesterol, Histidine, Saccharide Isomerate, Xanthan Gum, Cucumis Sativus (Cucumber) Fruit Extract, N-Hydroxysuccinimide, Retinol, Collagen, Copper Gluconate, Palmitoyl Pentapeptide-4, Acetyl Hexapeptide-8, Tea-Cocoyl Glutamate, Potassium Sorbate, Copper Tripeptide-1, Magnesium Aspartate, Biotin, Zinc Gluconate, Sodium Ascorbyl Phosphate, Ascorbic Acid, Palmitoyl Oligopeptide, Chrysin, Palmitoyl Tetrapeptide-7, Chlorhexidine Digluconate, Ceramide Eop, Titanium Dioxide (Ci 77891). 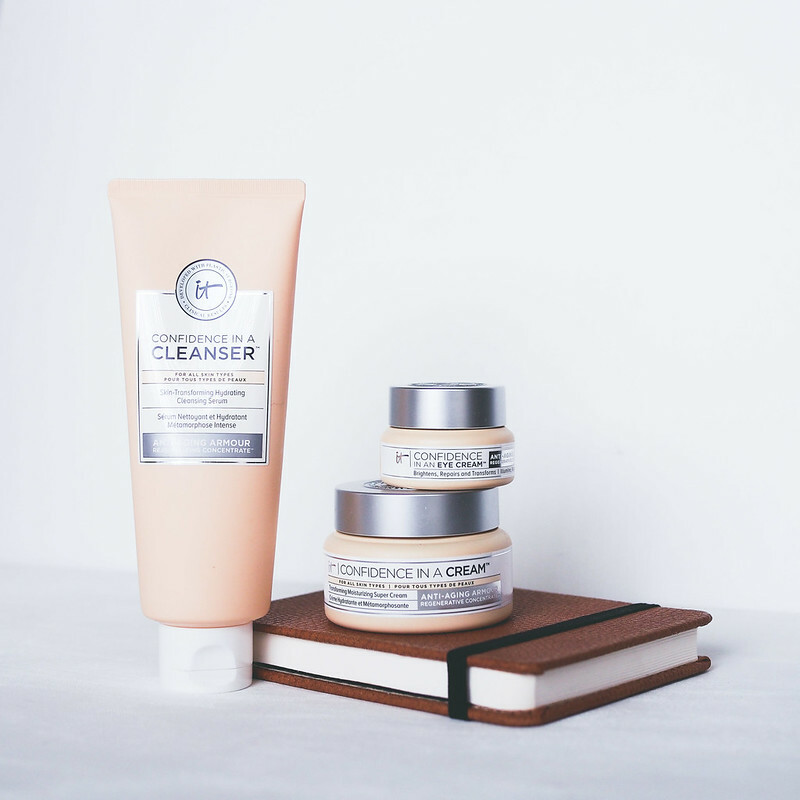 The IT Cosmetics Confidence Skincare range is a beautifully textured, easy to use collection that I would recommend if you are looking for powered up version of a minimal routine. 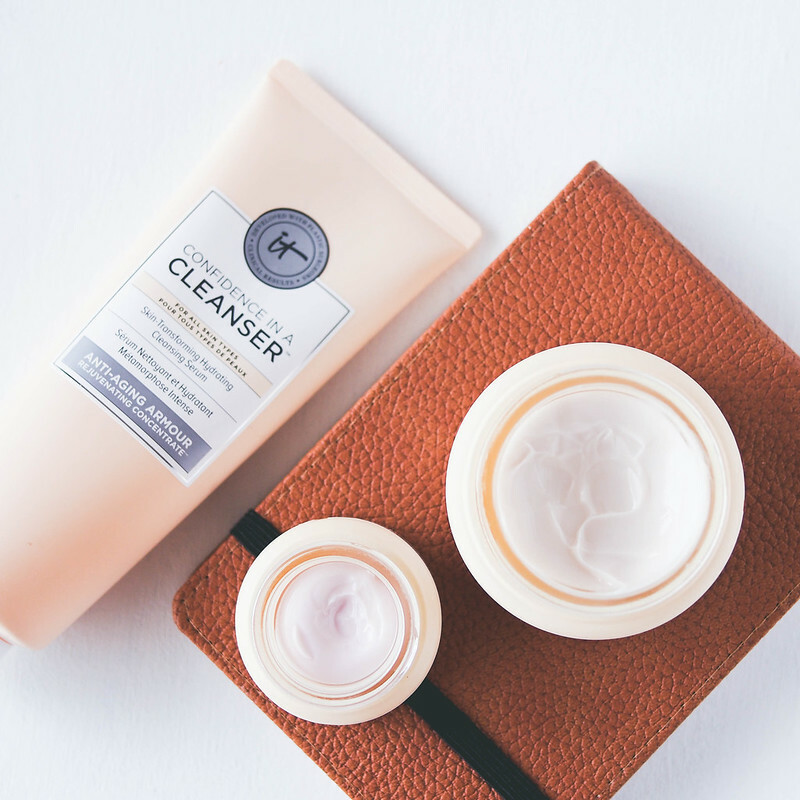 Best suited for combination, slightly oily or slightly dry skin of any age range, there’s some impressive ingredients in each formulation with a focus on natural additives so do have a read if you know you’re reactive to anything specific. I haven’t experienced any sensitivity or negative reactions. For the money, I think the range is well priced and certainly more promisingly than a lot of other higher end and fancier packaged options. I personally didn’t see a huge anti-aging improvement but I also don’t have a lot of visible signs to treat in the first place and it’s not my current main skin concern. It would be something I’d consider as preventive skincare if you’re similar to my skin age. As a personal tradition over the past occasions, I’ve started the year by choosing a new fragrance to celebrate and cement the upcoming twelve months. It’s a bit of a fussy process but one that I thoroughly enjoy as I want the scent to embody my goals and outlook for the upcoming year. 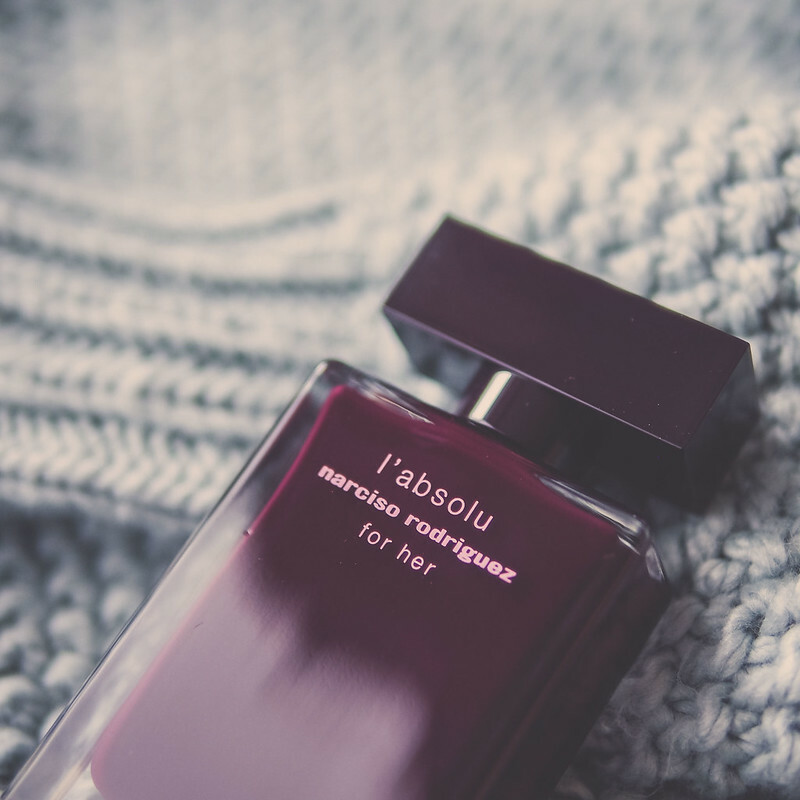 For 2018, I finally settled on L’Absolu by Narciso Rodriguez and I am thrilled about it. The fragrance is marketed as a floriental with notes of musk, tuberose, jasmine, amberlyn, sandalwood and patchouli. It’s available in an eau de parfum and is made in France. Though it’s been out for a few years now, it seems to be the less talked about of the Narciso trio however it’s no less lovely than all the others and I’d argue that it deserves its own applause. It you love the YSL Black Opium, you may want to investigate this. In fact, it also reads very similar to my signature scent, Guerlain’s Samsara but in a more modern way (Guerlain is undoubtedly a scent of its decade after all). L’Absolu is sweet, rich and slightly intoxicating but not in a young and brash way. In fact, for many years I’ve admired the Narciso aesthetic but didn’t feel ready to wear the brand. 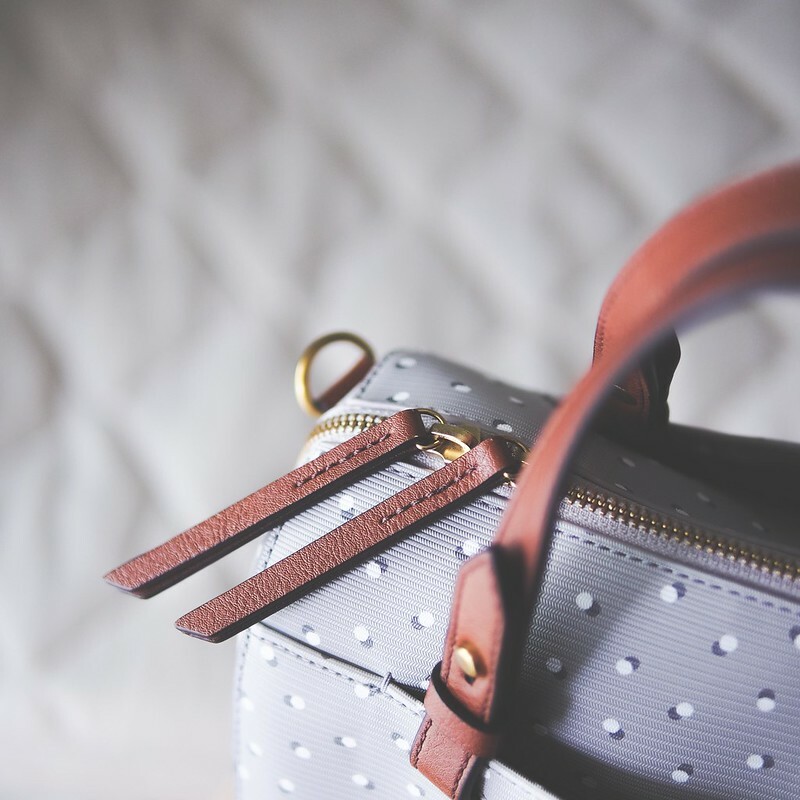 The Narciso woman is one who has a quiet confidence, a strong sense of self and is feminine in an elegant way. While many people love and wear the scent, I find that it pairs best with someone who carries themselves with more maturity. This is exactly the kind of woman I want to grow into in the next few years and so I thought it would be a great introduction to my everyday life. When I put it on every morning, I take a moment to remind myself that I have the inner strength to face all the upcoming challenges of the days, months and years. 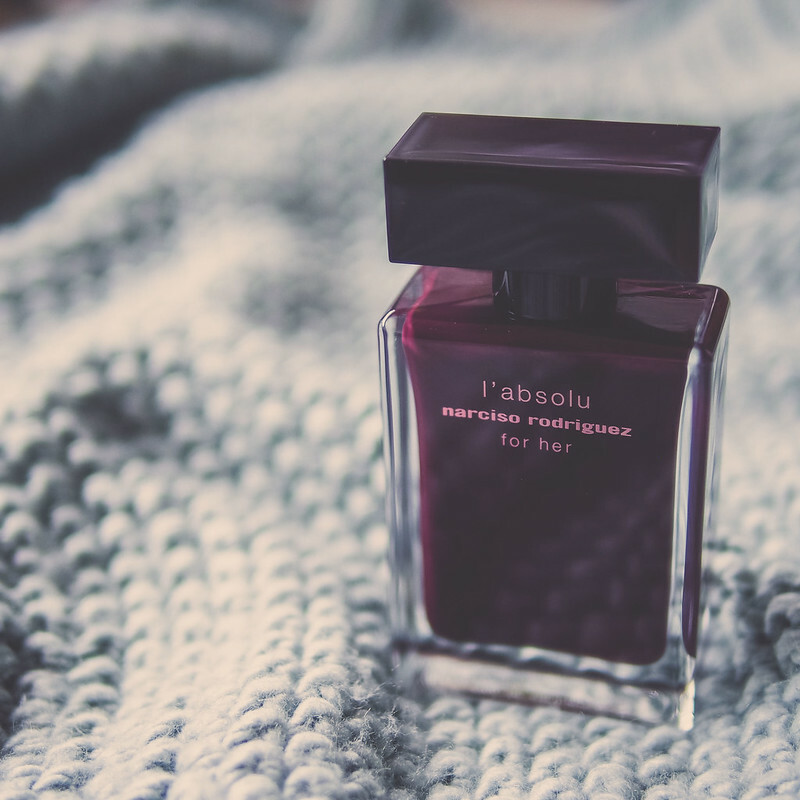 On it’s own, I do find L’Absolu to be a winter scent hence more suited to wooly coats, sweaters and the winter chill so coming into spring I have also purchase the original N.R. Eau de Toilette to pair with it. The latter is a better daytime and office appropriate choice which wears softer on the skin. I find both to be reasonably long lasting and it’s the kind of fragrance that others smell on you more so than you do on yourself so refrain from using a heavy hand. Coconuts. It seems to have firmly established itself in our regular beauty vocabulary and has become synonymous with hydration, moisture and maybe even a side of pina colada – hey, it’s brilliant for marketing after all. Among higher end options in Sephora, I decided to try my luck with the First Aid Beauty version which is oil-free, non-comedogenic and appears to be silicone free. It’s marketed as a moisturizer with added primer qualities. Ingredients: Cocos Nucifera (Coconut) Fruit Juice, Glucose, C12-15 Alkyl Benzoate, Maltodextrin, Aqua (Water, Eau), Cyclopentasiloxane, Butylene Glycol, Glycerin, Caprylic/Capric Triglyceride, Mica, Sodium Acrylate/Sodium Acryloyldimethyl Taurate Copolymer, Cocos Nucifera (Coconut) Fruit Extract, Selaginella Lepidophylla Extract, Prunus Armeniaca (Apricot) Fruit Extract, Pyrus Malus (Apple) Fruit Extract, Vanilla Planifolia Fruit Extract, Hydrolyzed Quinoa, Coffea Arabica (Coffee) Seed Extract, Dipteryx Odorata Seed Extract, Saccharomyces/Copper Ferment, Saccharomyces/Iron Ferment, Saccharomyces/Magnesium Ferment, Saccharomyces/Silicon Ferment, Saccharomyces/Zinc Ferment, Camellia Sinensis Leaf Extract, Chrysanthemum Parthenium (Feverfew) Extract, Glycyrrhiza Glabra (Licorice) Root Extract, Ethylhexylglycerin, Sorbitan Oleate, Dimethicone Crosspolymer, Isohexadecane, Acrylates/C10-30 Alkyl Acrylate Crosspolymer, Polysorbate 80, Lactobacillus Ferment, Leuconostoc/Radish Root Ferment Filtrate, Phenoxyethanol, Disodium EDTA, Tin Oxide, Benzyl Alcohol, Potassium Sorbate, Sodium Benzoate, Sodium Hydroxide, CI 77891 (Titanium Dioxide), CI 77491 (Iron Oxides). I’ve always liked the fact that FAB markets itself as a no-fuss but still bright and cheery kind of aesthetic and this primer follows the same easy to use packaging as the rest of its line. The plastic tube is sturdy, easy for traveling, holds a lot of product and dispenses easily via simple twist off cap. 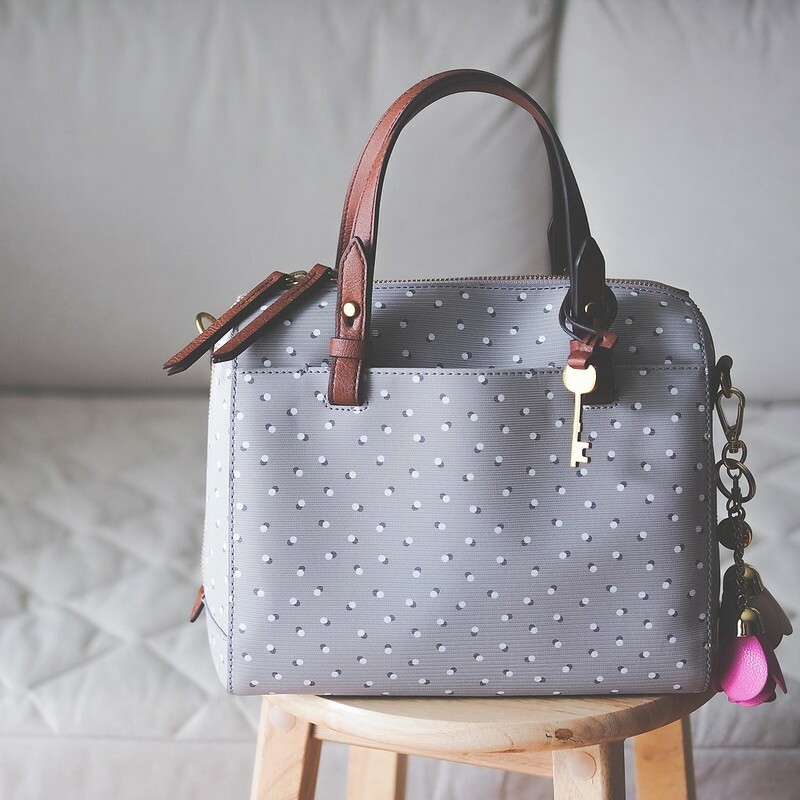 The overall vibe feels happy but nonchalant and looks right on any makeup table. 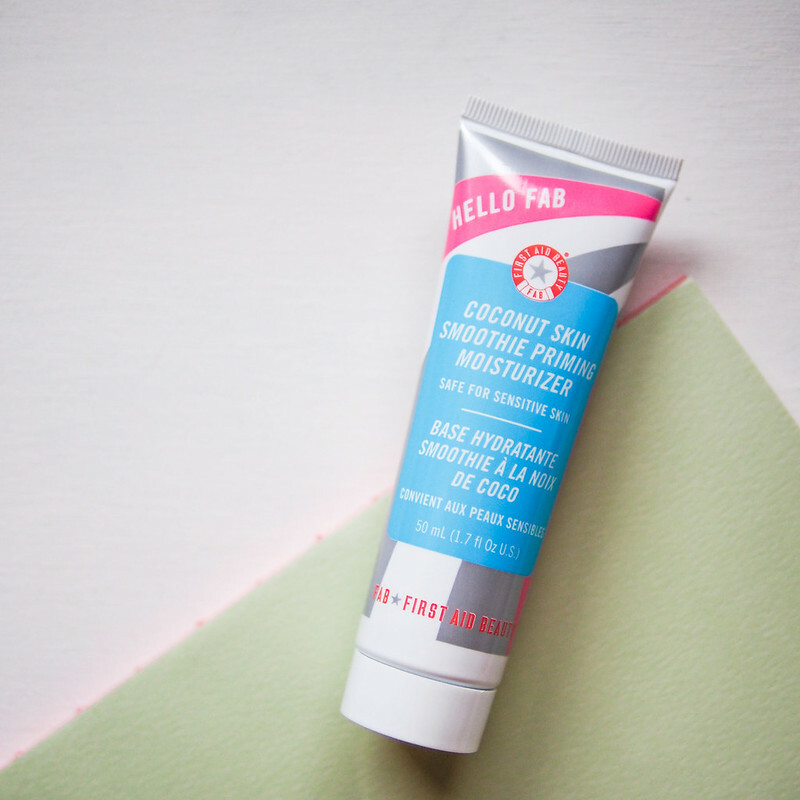 Scented like a coconut smoothie, this primer has a creamy consistency similar to a moisturizing cream and definitely denser to the touch than I expected. 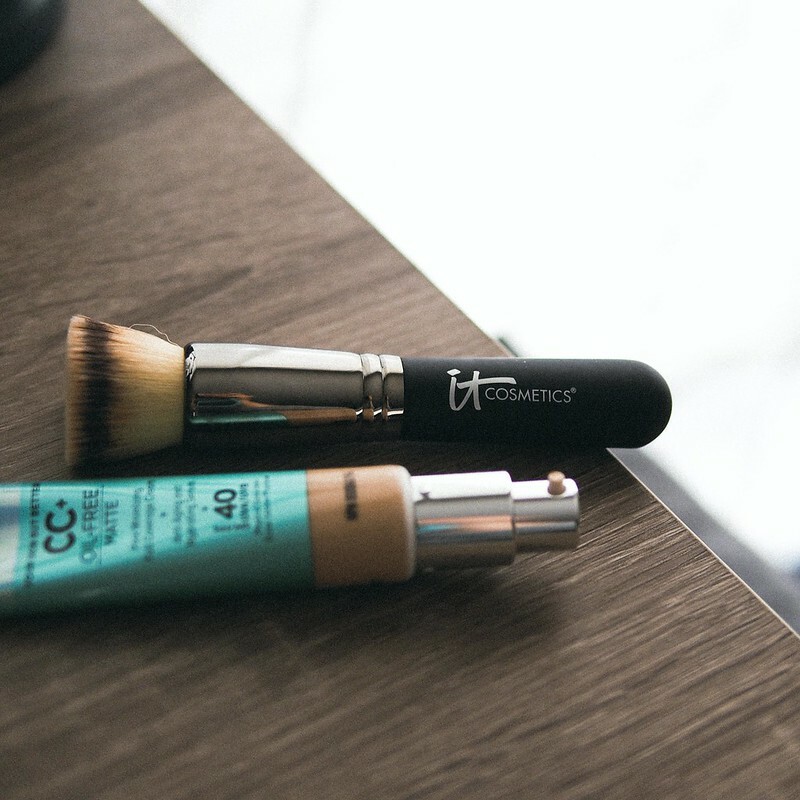 While it’s advertised to be silicone free unlike more traditional primers, it still has a smoothing touch once applied on the skin and the extra silky effect is helps to minimize dehydration lines and some minor pore texture. On the skin, its slightly slick but not tacky. In comparison, it’s closer to the feel of the Make Up For Ever Skin Equalizer* but much more emollient than the Shu Uemura Stage Performing Primer*. There is a hint of shimmer mixed into primer but it’s essentially negligible once a medium coverage foundation is applied on top. 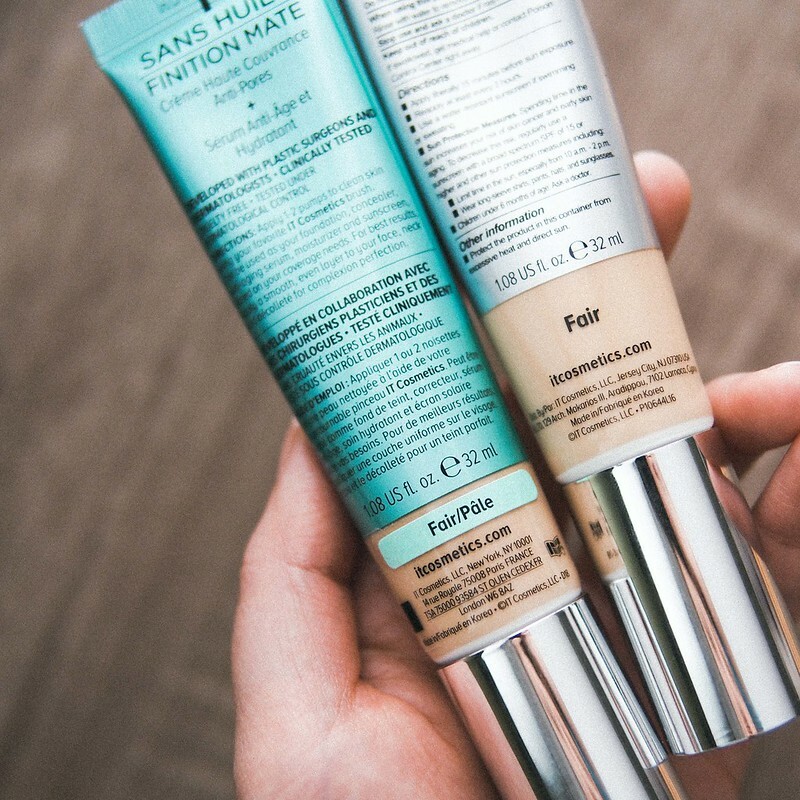 One of the things I loved about this primer over others is how it manages to work well with a variety of my foundations. Though I do tend to only use primers over thicker, higher coverage liquids or powder foundations in other to smooth my skin texture, this hasn’t had any trouble with all I’ve thrown at it so far. It helps to minimize that odd patchiness when on my nose and it does a good job at keeping my skin plump. I don’t think it necessarily makes my foundation last any longer than usual so I see it more as a prep product rather than a wear extending one. r underneath this instead of replacing my face cream so that could be a factor. For those with dry to super dry skin, this might be just what you need however, it’s not a year round pairing for my combination skin-type. First Aid Beauty’s Coconut Skin Smoothie Priming Moisturizer is a rich, emollient two in one cream that helps to soften skin texture while allowing foundation to blend and sit smoother. Worn alone, the slight shimmer is visible though not overbearing and under a medium coverage foundation, it’s nearly undetectable. I love the use of natural ingredients, the affordability and how it helps to prevent matte products from clinging to dry patches which is really important in my beauty routine. 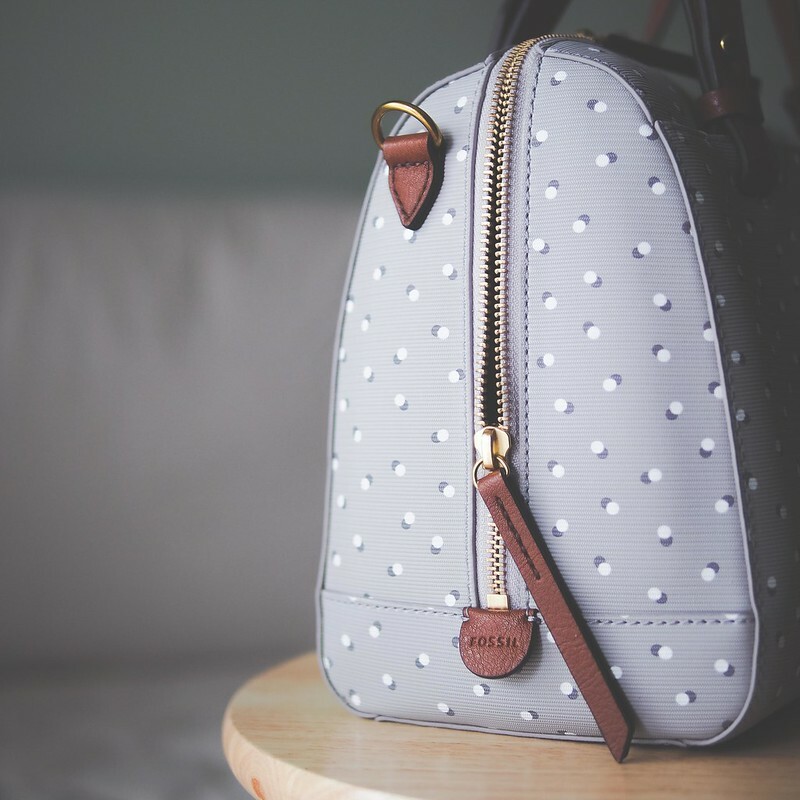 The texture, while great for winter time, may be too heavy for those with oilier skin. 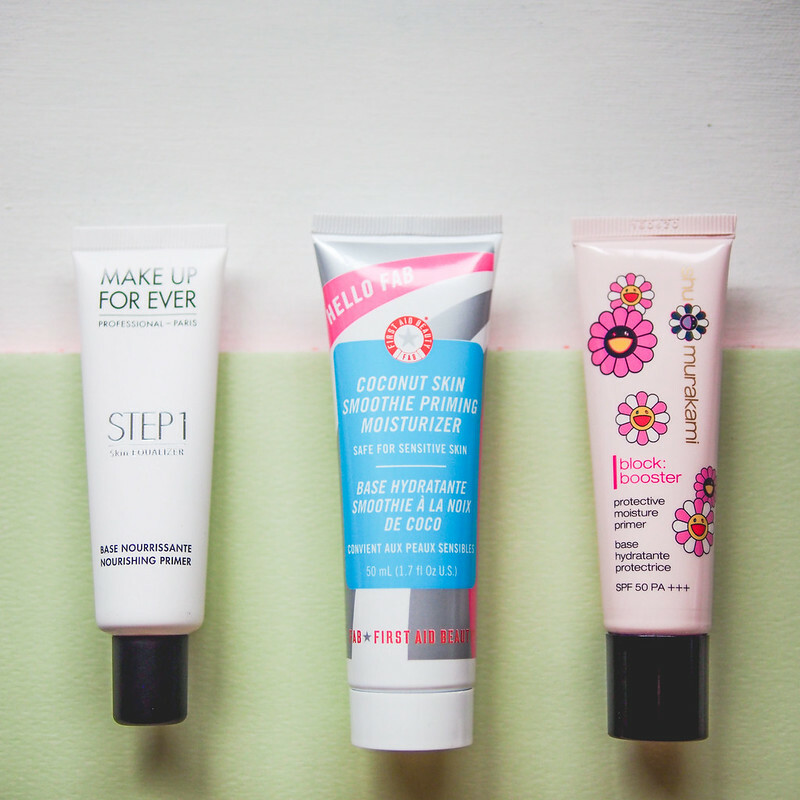 While I will be trying out other similar coconut based primers from other brands, I can see this as being a solid stand by for many people -worth a try! 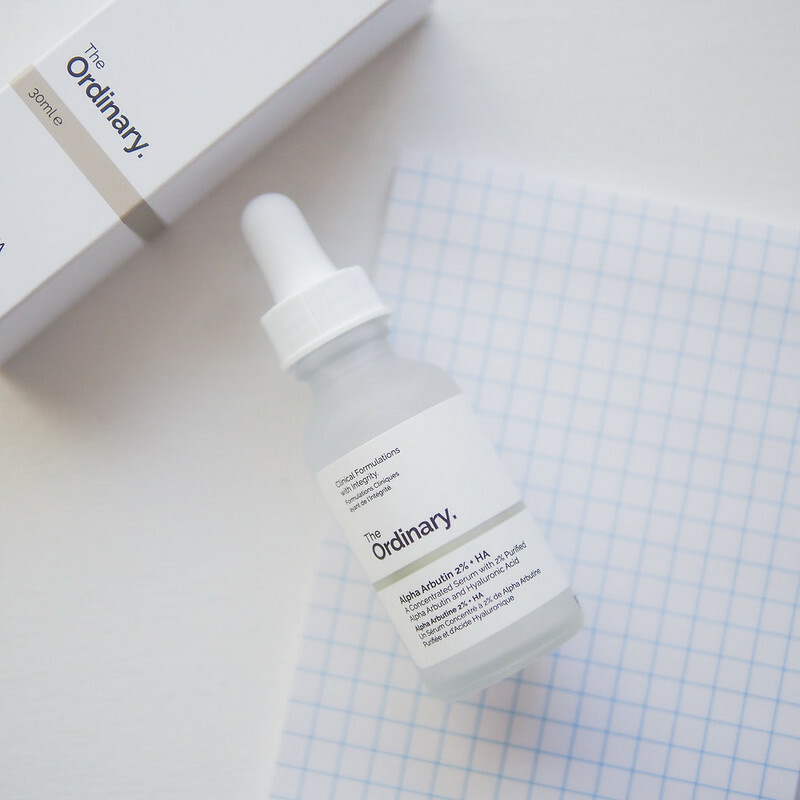 Canadian brand The Ordinary lit an instant frenzy amount beauty enthusiasts by giving use what we’ve been asking for all these years. Simple, ingredient based products focuses on the science of what works and scrapping all the fillers…all with a shockingly low price point. 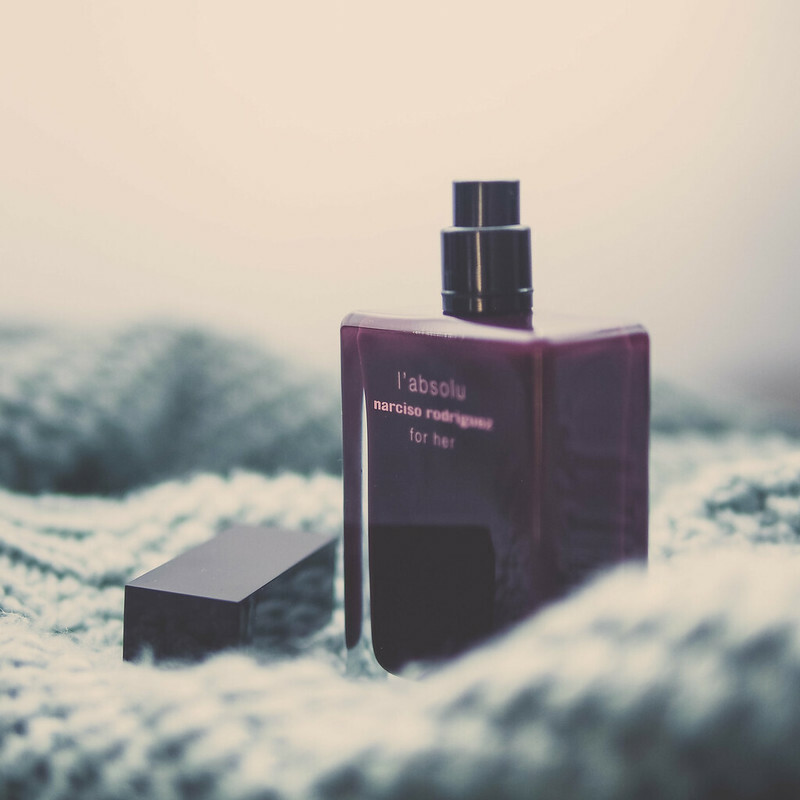 After a good decade experimenting with my own skin concerns, I felt relatively confident in knowing the handful of ingredients seemed to be the most effective and was thrilled to see two of my favourite things arbutin and hyaluronic acid mixed into one bottle. Alpha Arbutin reduces the looks of spots and hyper-pigmentation. 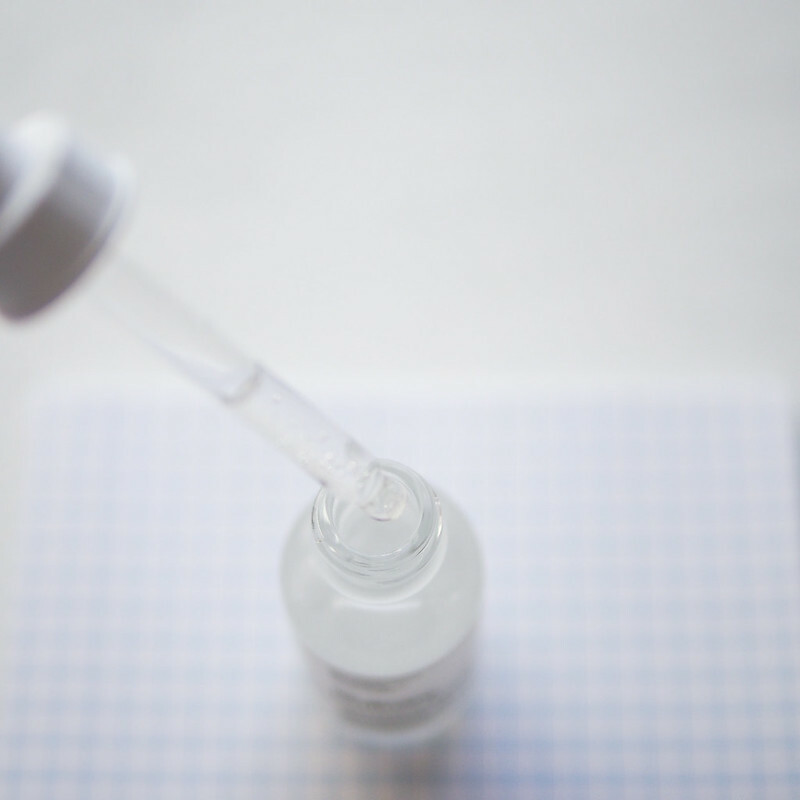 It’s used at a high 2% concentration versus a standard concentration of 1% and supported with a next-generation form of Hyaluronic Acid for enhanced delivery. Alpha Arbutin is much stronger in effect than Arbutin or Beta Arbutin. I’ve long struggled with uneven skin texture, uneven skin tone and large pores. Though I’m naturally light skinned, I scar and mark easily which is evident on my forehead and some pigmentation spots scattered throughout. Dispensed from a dropper style lid, this arbutin treatment has a clear but slightly viscous consistency and beads on the skin almost like a fluid gel. 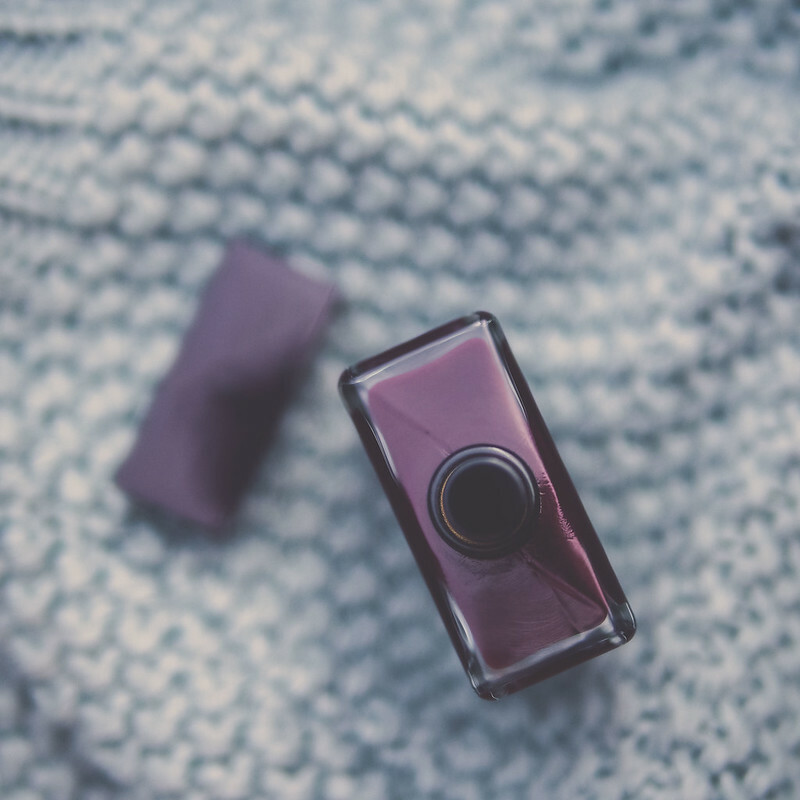 It spreads easily, dries quickly and appears to form a very thin film over the skin which isn’t noticeable at first but is certainly obvious when a sticky layer starts to form on the neck of the bottle. Only about 3 drops is necessary to cover my entire face generously. There is a slight bit of tackiness but it shouldn’t be a problem after adding a moisturizer. Having used this consistently twice a day for about 5 weeks as my sole treatment product I did notice some slight overall evening in my skin tone. I wouldn’t say it effectively treated any dark marks I had but it was just as effective as many of the higher end products I’ve used, some even at up to 10x the price of The Ordinary so that’s definitely a win in itself! I had started to experience minor red spots and increased clogged pores but can not be 100% certain if it’s due to this treatment or the moisturizer I had been using. While there was nothing in the ingredients list that looked like an alarming red flag, the fact that this forms a film over the skin raised some doubts. I’ve since discontinued both and may try reintroducing this treatment back into my routine to see if it’s the real culprit. I did not otherwise notice any other redness or sensitivity. There is no fragrance in this product. 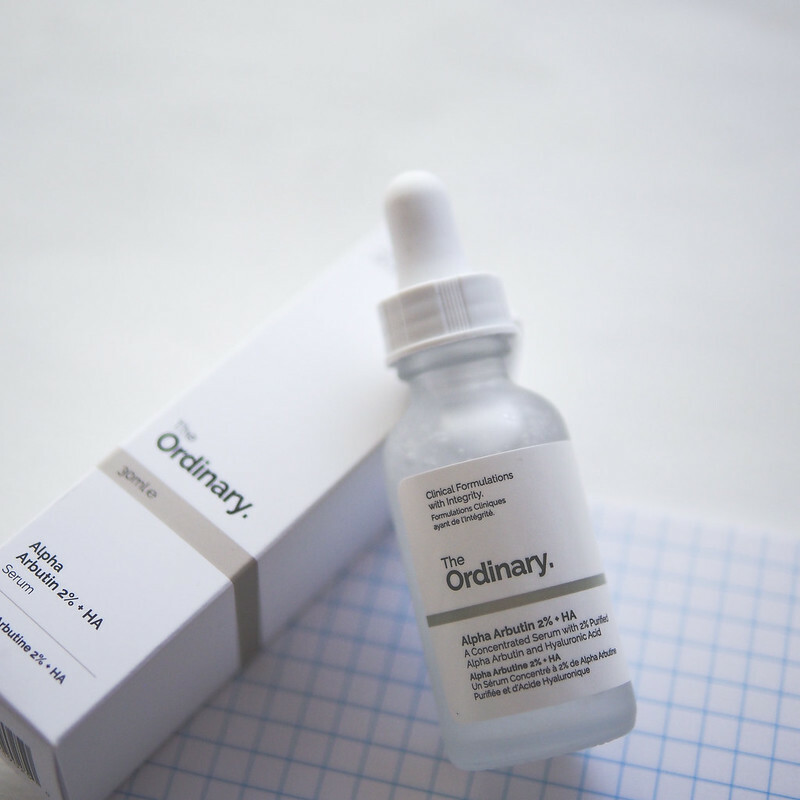 The Alpha Arbutin 2% HA treatment by The Ordinary is a lightweight, fragrance free treatment that rivals many of the higher end skin tone enhancing products on the market. 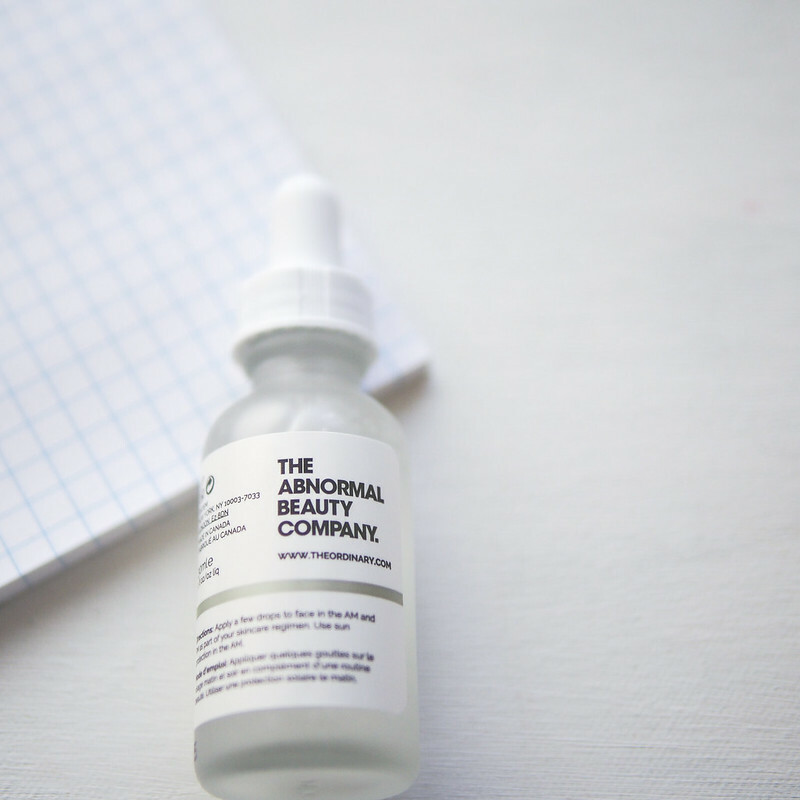 The texture should be comfortable enough for most skin types yet despite containing hyaluronic acid, I did not find this very hydrating and I recommend an additional layering serum if moisture is a concern. My main disappointment was not seeing the great results I had with other arbutin based Asian products but I can say this is as good as other effective western brands I’ve used to date. I’m also not a fan of the texture and sensorial experience. 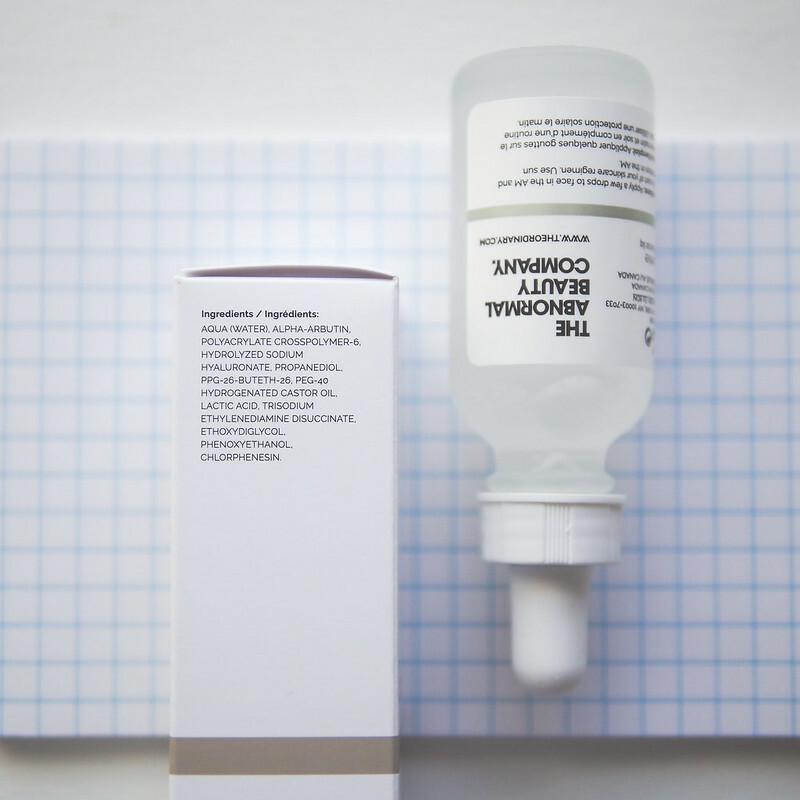 The Ordinary does recommend combining this with other products and many people choose to couple this with an exfoliator. Given the price point however, I would suggest you try this first if arbutin is what you are looking for and I do think it trumps most of what you can find at the drugstore level.